Hola is one of the best free tools to access blocked websites or bypass Geo-restricted (region specific)content. Hola also protects your privacy by hiding your real location (IP address) and web activities. cache makes web pages load faster. 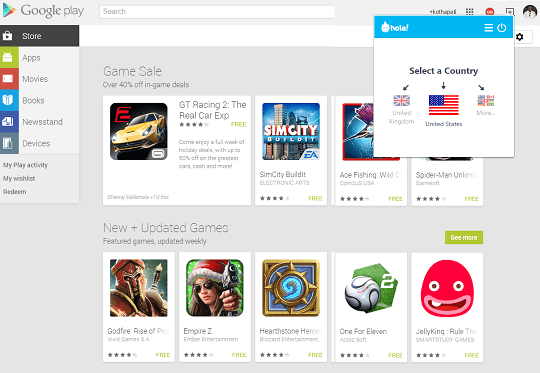 (Android & iOS) and desktop application (Windows & Mac). The best way to utilize Hola is installing as an add-on/extension on your regular browser, especially on Google Chrome browser it’s much quicker to install and less intrusive. When you install the extension, the VPN service just sits on the browser tool-bar, you can click its icon to turn it on and off. 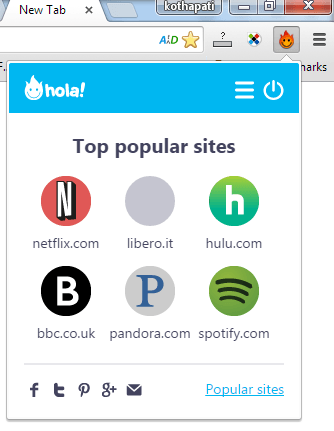 On a new tab-page when you click the Hola button, it will display 6 top popular sites you can access such as Netflix, BBC, Pandora, Spotify, Hulu, and libero. Furthermore clicking on the ‘popular sites’ link will launch the service webpage displaying top sites in your country. Also, when you visit a particular website on your browser and it’s blocked in your region or country, then quickly hitting the extension button will display a suitable country (indicated with a flag) you can access the site. For instance, if you are accessing a promotion Page restricted to France, all you need to do is visit the page on your browser and click on the ‘Hola’ button, it will certainly display the ‘France’ country flag to let you select to browse from that region. Next, reload the page and you can access the restricted page. The developer promises the VPN service will provide unlimited bandwidth by using peer-to-peer technology, but your connection speed will slow down when you have consumed more than 1GB of data in a single session. Overall, Hola is a lightweight and fuss-free tool to quickly access blocked or region restricted content by hiding your real identity. In my view instead of installing a VPN software, we can install this tiny extension on our browser, especially on Google Chrome it’s a must-have extension. You can signup a free account from the developer webpage and based on your requirement you can either download the browser extension (add-on) or app for your Android, iOS, Mac and Windows devices from the official page.